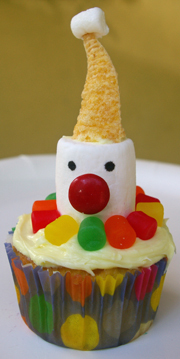 These fun clown cupcakes are based on a design I saw a few years back in a Martha Stewart publication. The hat is a Bugle snack! What You Need: 1 cupcake; frosting color of choice; 1 large marshmallow; 1 small marshmallow; food-safe pens; mini jujubes in various colors; red M&M; 1 Bugle. How to Make It: Frost cupcake. Use food-safe pen to add dots for eyes to marshmallow as shown. Use dab of icing to attach red M&M for nose. Place marshmallow flat side down in center of cupcake. Surround with mini jujube fruits, larger side facing outward. Use icing to attach small marshmallow to end of Bugle, or just poke it on there. Attach Bugle to top of marshmallow for hat. You could also choose to decorate the hat. This entry was posted on Monday, June 15th, 2009 at 9:35 am	and is filed under character cupcakes, people cupcakes. You can follow any responses to this entry through the RSS 2.0 feed. Responses are currently closed, but you can trackback from your own site.